Prerequisite course subsection settings No. For more information, see Use Re-Run to Create a Course and Update the New Course. To re-run a course, users who have the required permissions follow these steps. Sign in to Studio. Your dashboard lists the courses that you have access to as a course team member. Move your cursor over each row in the list of courses. The Re-Run Course and View Live options appear for each course. Locate the course you want to re-run and select Re-Run Course. 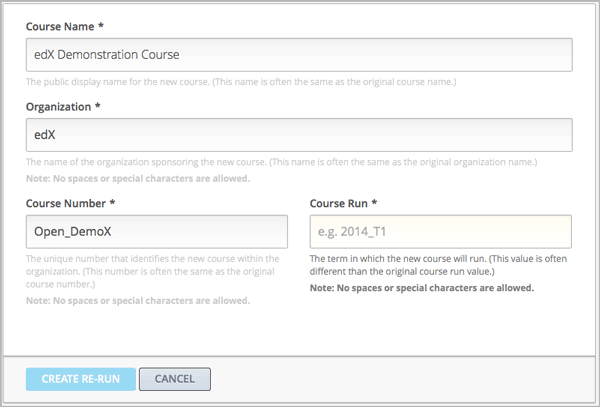 The Create a re-run of a course page opens with values already supplied in the Course Name, Organization, and Course Number fields. Supply a Course Run to indicate when the new course will be offered. Together, the course number, the organization, and the course run are used to create the URL for the new course. The combination of these three values must be unique for the new course. In addition, the total number of characters used for the name, organization, number, and run must be 65 or fewer. Select Create Re-Run. Your My Courses dashboard opens with a status message about the course creation process. Duplication of the course structure and content takes several minutes. You can work in other parts of Studio or in the LMS, or on other web sites, while the process runs. The new course appears on your My Courses dashboard in Studio when configuration is complete. Add course team members, including discussion admins, moderators, and community TAs. See Add Course Team Members or Course Staffing. Update course-wide dates, including course and enrollment start and end dates. See Scheduling a Course Run. For a course that includes drag and drop problems, replace any problems created prior to April 2016 with the newer drag and drop problem component, which is accessible and mobile ready. For more information about enabling the new drag and drop problem type and adding these problems to your course, see Drag and Drop Problem. The following additional changes can also improve the experience of learners who enroll in the new course run. Review the staff biographies and other information on the course About page and make needed updates. See Planning Course Information and Planning Course Run Information. For a course that includes core problem types, including checkbox, text input, or math expression input problems, review the Markdown-style formatting or OLX markup of any problems created before September 2016. For more information about the updates that you can make to improve the accessibility of these problem types, see the Release Notes. If your course uses prerequisite course subsections to hide course subsections until learners complete other, prerequisite subsections, configure the prerequisite course subsections. See Configuring Prerequisite Course Subsections. If your course includes instructions for learners, verify that the instructions reflect the current user interface of the LMS. For example, you could revise a description of the problem Check button, which was accurate before October 2016, to reflect its new label, Submit. For more information about tools and ideas that can help you prepare a course for launch, see Course Launching Activities.